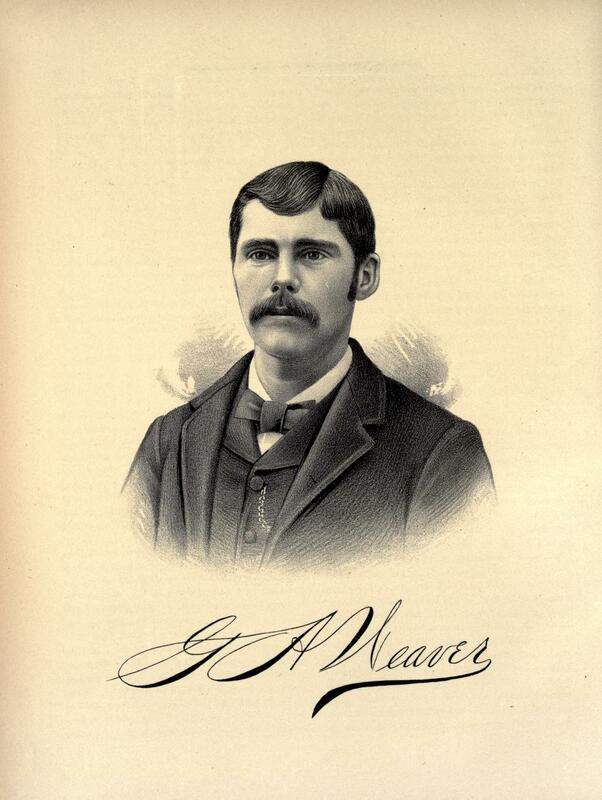 GEORGE A. WEAVER is a member of the extensive mercantile house of Weaver & Edwards, of Sorento. He was born in Cumberland County, this State, on the 22d of October, 1862, and is a son of A. D. and Elizabeth A. (Armstrong) Weaver. But little is known of the ancestry of either of these families. They were both born in Ohio and came to Illinois about 1840, and when our subject was but a few months old they located in Coles County, not far from Mattoon. There the father had a small farm, and, being a man of some learning, taught school in that locality for some years. He served during the late war in Company K, of the Fifty-fourth Illinois Infantry, and three of his brothers also served in the army. 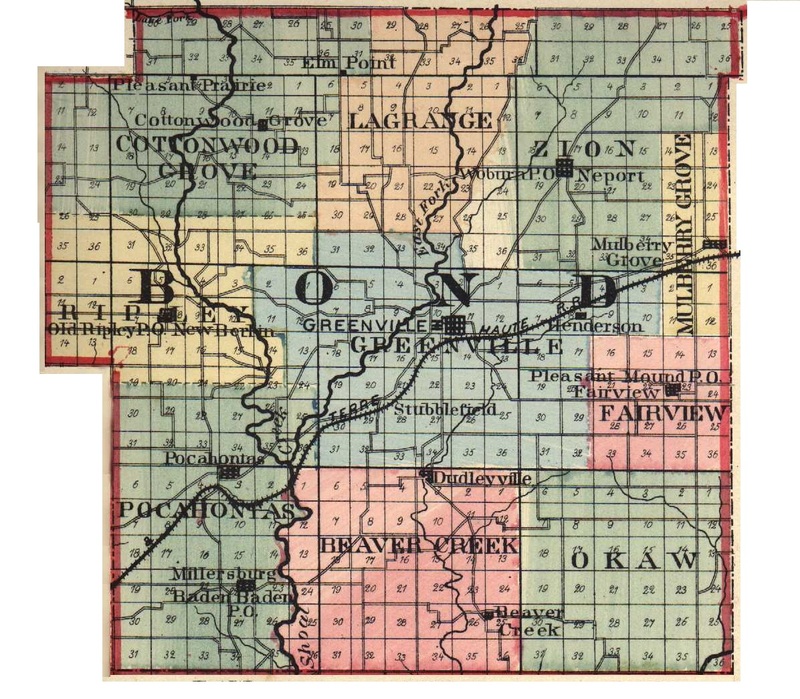 About 1870, the family moved to Greenville, Bond County, where the mother expired in 1873. After this young Weaver had to make his own way in life, his father being a man of very limited means. He early applied himself to securing an education, at the same time contributing to the support of his two young sisters. After he was twenty-one years of age, he entered the Gem City Business College, of Quincy, from which he graduated in 1884. He was then tendered the position of book-keeper for the Colchester Coal Company. This he accepted, remaining with them for a year, and then resigned the position in order to accept that of confidential clerk to W. S. Dann, the merchant prince of Southern Illinois, and located at Greenville. This position he held more than four years, but our subject was not made of the kind of stuff that would long be content to work on a salary. He wanted to forge to the front and be a merchant prince himself. With this end in view, Mr. Weaver came to Sorento in 1889, and with his meagre savings, in company with a Mr. Maxey, opened a small store. He was possessed of business ability and push, and the capital that he lacked to transact an extensive business was readily furnished by parties having not only the money but unbounded confidence in the integrity and ability of this rising young business man. The partnership with Mr. Maxey lasted only a few months, when O. M. Edwards, a wealthy farmer living near Sorento, became the junior and silent partner in the firm, leaving the active transaction of the business entirely to Mr. Weaver. The financial interests of the firm have reached goodly proportions and the business is steadily increasing. They now carry an immense stock of general merchandise, and one that would be a credit to a much larger town than is Sorento, yet the trade demands it, and this is largely due to the management of our subject in his popularity as a tradesman. He has ever been active in whatever is for the benefit of a thriving little town, and many of the enterprises of the place have found a helpful hand in this wide-awake business man. Mr. Weaver is the eldest of a family of five children. His father died February 24, 1880. Of his brothers and sisters, Thomas lives in Oklahoma; John is in the employ of his brother G. A.; Laura lives at Pocahontas, and Ruth in St. Louis. Mr. Weaver was married December 15, 1886, to Miss Alice M. Presgrove, who was born in Clinton County, Ill., October 18, 1863. She is a daughter of B. F. Presgrove. Of the two children that have blessed this union, the eldest, Vallee W., died when but nine months of age, August 3, 1888. The surviving child, Vernon A., was born August 10, 1889. Politically, our subject comes from a strong Republican family, but is himself an equally ardent Prohibitionist and has always been a strict temperance man. Extracted 04 Dec 2016 by Norma Hass from 1892 Portrait and Biographical Record of Montgomery and Bond Counties, Illinois, pages 188-190.